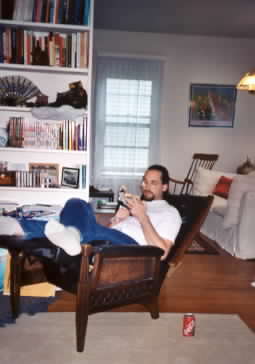 Mike and Susan's apartment. 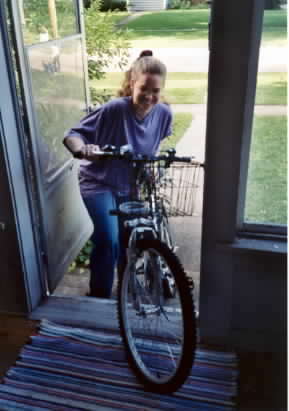 Susan is proudly showing off her expensive new mountain bike, which, shortly after this photo, was hit by a car. (No major injuries, just a nice white streak of paint on the bike). 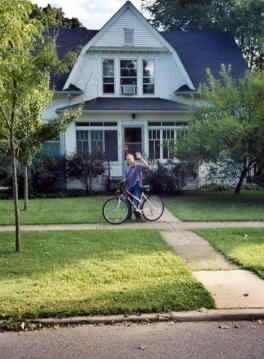 About six months later, Mike was hit by a car while riding his dad's Schwinn. Hmmm... what do Illinois drivers have against bicyclists? We've decided to stay here another year, Mike at his Dundee-Crown H.S. English teaching position, and me at (currently) the Northwest Herald Classified section. After that, who knows? No bikes in the house!! Just kidding. 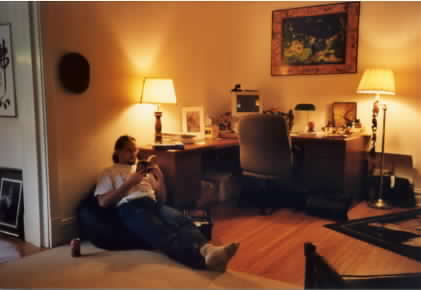 But this central room has changed shape many times since we started renting here in September '01. The high ceilings and large open rooms make it easy to switch things around.